Karen – these are lovely, with a very Zen feeling to them. It was a zen-like day out there. Thanks very much, Melinda. Heavenly photos, Karen. So peaceful and to think there is life waiting under that snow and ice. I just love these, Karen, I never see anything like this with my own eyes and your view is superb. The paleness, the stillness, the simplicity, the complexity are beautiful. seemed to have no intention too. It’s just there, as we happen to be here. Much thanks, Nathan. I’m happy to garner that sort of reaction from you. Love the barely perceptible horizon in the third shot…Zen and origami…folded white paper. A breathy, audible “wow” from me. Scilla, I love your comment. Beautiful words. Thank you! I really like the composition of that first photo. Very striking. Marina, I always look forward to this time of year and this landscape. Thank you! Muffled sound and clean air.. beautiful.. I love minimalism.. Snow can be so photogenic with the right eye which you have Karen..
We seem to have endless grey skies, rain and gloominess here right now! Thanks, Helen, you are very kind! I hope you get some sunshine, or snow, (or both!). Adrian, much thanks. I’m glad you feel that way. Hushed beauty. I love your minimalist work – especialy the second, third and fourth – and admire your subtle control of tone. A fabulous series – I particularly like the first picture. The single tree in the white landscape is my favourite, but they are all lovely. The blankness is so beautifully invigorating, and so inviting! It is invigorating in it’s cold freshness when you are there! Thanks very much, Patti. Fantastic images. I really like the third one with the lone tree on the right. cool compositions ! : ) } I also like third one – Mike has good taste ! Need I comment on your exceptional photos? Nnnnnuuuuuuuh!!!! So peaceful and lovely. A wonderful stillness in these images. I like the comments here. Happy New Year Karen. Here’s to shooting beautiful photographs. That horizon line is pretty special in all of them Love the third the best. Carla, the horizon was sort of glowing for a few minutes. I don’t think I really caught the essence of it. Light is just so fleeting sometimes! Thanks for your comments. I really like the stark minimalist views you have displayed here Karen. I love these compositions – they emphasise the trees’ vulnerability and in a few of the shots the trees seem to be trying desperate for our attention – creating a sort of bittersweet comedy. Great shots, Karen. Such an interesting interpretation. I always love to read your comments, Richard! Thank you. Amazing photos as always! 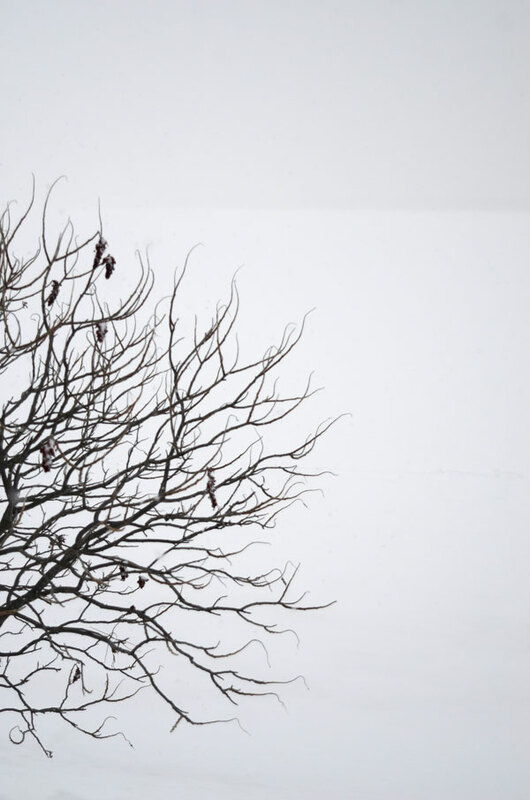 I love how you captured the stark beauty of winter. Happy New Year, Karen! Thank you, Karen. Happy New Year to you also! Emily, they grey is working for you from the last post I saw! 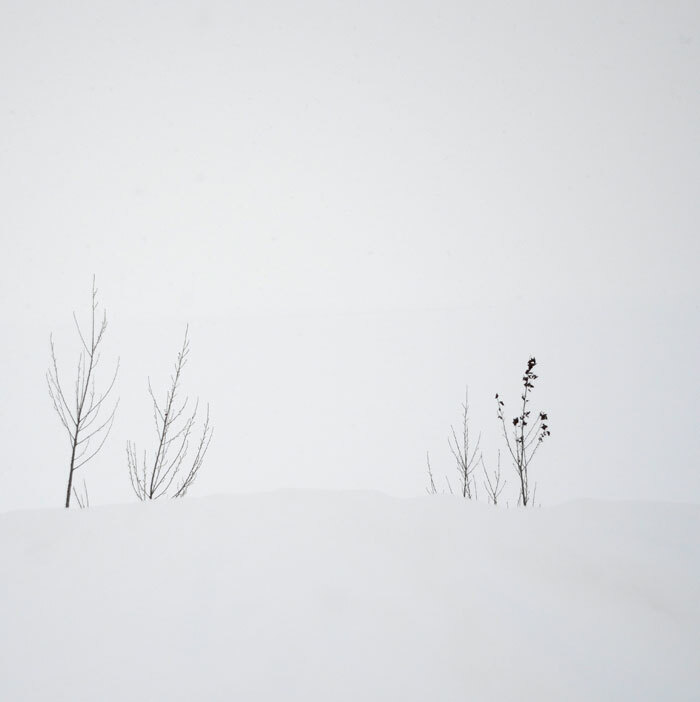 Thank you, I love the starkness of the snow, like a fresh start of the landscape, in a way. De son Humeur Légère , sur le Seuil du Vivant . Beautiful forms. Love the framing, especially the first and third. Thanks you, Simon. The first image is a sumac tree. They seems to have such elegant form. 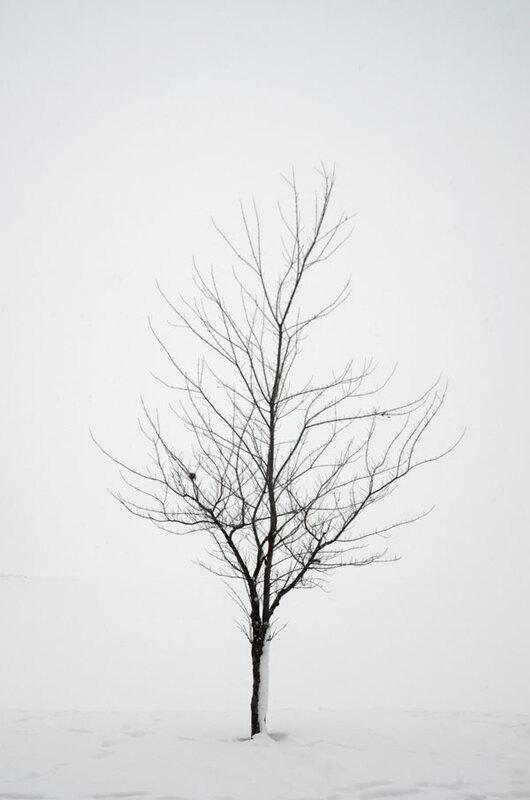 Really like the simplicity in these images, the two different tones of white, and the black of the tree. Thanks for sharing. Such divine purity of form. I love those winter forms of nature. Thank you, Elena. I love to fall into your white world..beautiful and spare..wonderful. a beautiful title and soothing minimalism!! That’s a kind comment, Jan. Thank you. You are absolutely right! Those times when there is ‘nothing’ to photograph are so great – fog, rain, dark, snow, etc. Yes, somehow those are the moments that pull at me the most. Some of those remind me of the painting you have… I think the title is ‘pay day’ or ‘pension cheque’ …. Oh know the one you mean, yes minimalist! Oh, the air was quite fresh that day. Freezing fresh! But the light was sublime. Thank you, Alessandro. Very beautiful and peaceful. I always find it hard to get the white balance right in shots like these, but you always do it so well. Hi Inga, white balance can be a bit tricky. It’s something I have experimented with quite a bit. Thanks very much! 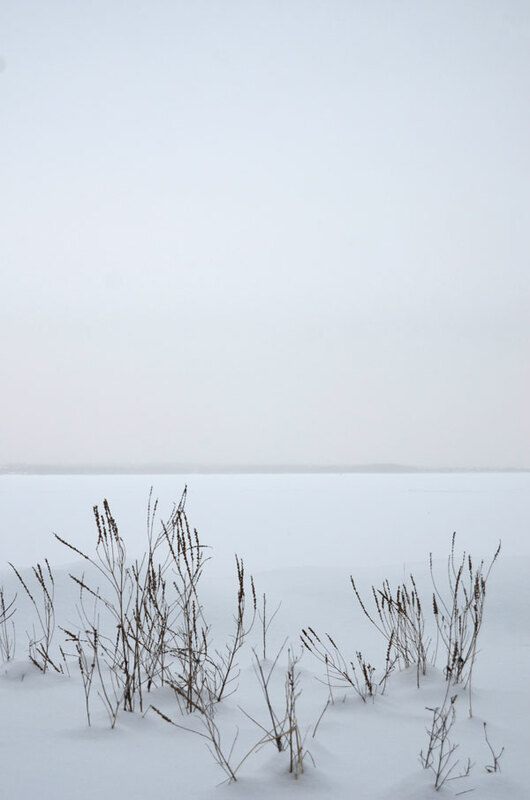 Definitely getting a hint of Akos Major (“minimalist landscape photographer”) in these photos! Kevin Saint Grey as well! I adore the last three images, Karen! 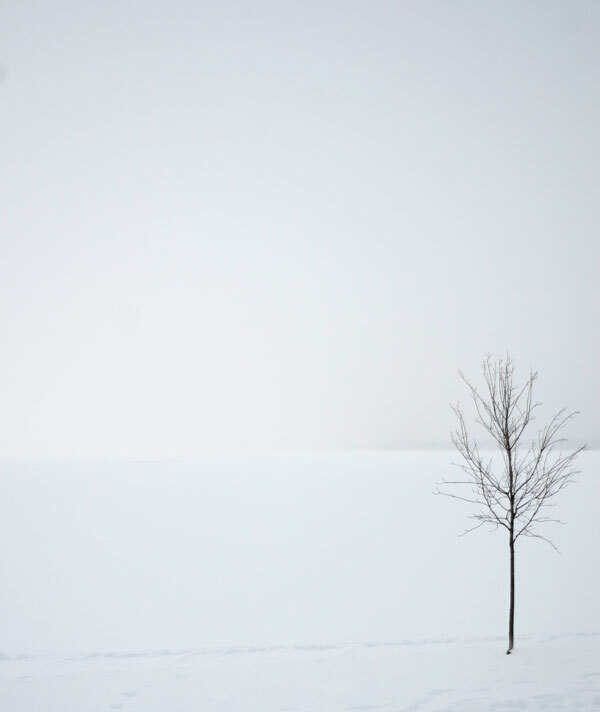 I love the way you produce quite beautiful ‘minimalist’ landscapes that have maximum impact! Thanks ever so much, John! AH, Just lovely. I think this is my favourite time of year to be out with a camera, or to draw. There’s a stark simplicity to space and line and form that allows real breathing space – moments to stop and really see properly. Undistracting and undistracted. Thanks, Sydney. Yes, it’s a whole other world isn’t it? A kind of simplicity I’m drawn to, also. The first one is my favorite, cause it made me surprised. I mean it’s surprising to see those things dramaticly coming up from the left side. Surprise is a nice reaction; with all the images out there in the world, to be able to surprise someone is lovely. It is a sumac tree pictured here – I love the reaching form. I love the starkness of these.